Buy 100% pure, compositionally balanced and efficient Cetyl Chloride at market leading prices. Our company is ranked among reliable Manufacturers and Suppliers of Cetyl Chloride. We hold years of experience of formulating Cetyl Chloride of unmatched. Buyers can obtain Cetyl Chloride from us in bulk and ask for customized packaging solutions. 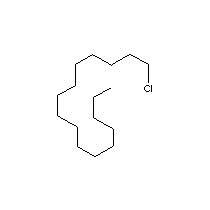 Classification : Cetyl Chloride (also called 1-Chlorohexadecane) is a clear to pale yellow liquid belonging to the family of organic halogen compounds. It is hard to dissolve in water, but can be mixed with alcohol and ether. This chemical is less health hazard substance than short chain alkyl chlorides. But it gives off irritating or toxic fumes (or gases) in a fire. It is used as a solvent, as an chemical intermediate to make photographic chemicals, pharmaceuticals, organometallic compounds, surfactants. Applications : Cetyl Chloride is used in organosynthesis, organometallic compounds manufacturing, surfactants and as a solvent.